Actually, I thought it was finished until I looked at the picture and realized that I didn't put anything in the bobbin holes .... I think it's a nice addition. So, I'll pick something tomorrow ... probably black. And then I'll get them (this and the brown one finished yesterday) photo'd for the shop. I made two changes on this one ... the bobbins are E6000's together versus sewed, the the threads coming out of the bobbin are stitched to stay securely in place and not have an opportunity to slip of the outside bobins. 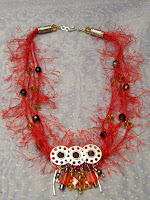 I'll go back and make this change to the brown fiber necklace as well. I like these and have no doubt there will be more .. probably when I again come across a necklace or bead combination begging to be reinvented.